The global air quality monitoring equipment market has been envisaged to be characterized by fierce competition amongst industry players as international companies look to cement their position with similar products in their offerings. This is expected to introduce more and improved varieties of products, viz. airflow meters, clamp meters, carbon monoxide meters, and gas analyzers. Extech Flir, Fortive Corporation, Horiba, and Lutron are some of the worldwide players projected to compete against each other through innovation and technological advancement. With such intense level of competition alive in the market, a steady growth is foreseen to be on the cards. After a painstaking analysis by Transparency Market Research (TMR), the world air quality monitoring equipment market has been foretold to improve to US$8.9 bn by 2024 while rising at a CAGR of 9.1% from US$4.4 bn in 2016. The basic function of the product could prove significant for the global air quality monitoring equipment market to draw in a handsome amount of revenue. Although it looks obvious and simple, the monitoring of air quality to curb the threat of air pollution elevating at a petrifying rate globally has been anticipated to emerge as a telling growth factor. The need to efficiently monitor air quality is also accounted to the efforts taken for controlling the emission of air pollutants and toxic greenhouse gases. In this regard, various provincial and federal governments have taken initiatives by formulating air quality health index, specific actions, new legislations and policies, and programs such as BC SCRAP-IT and Air-Care On-Road. 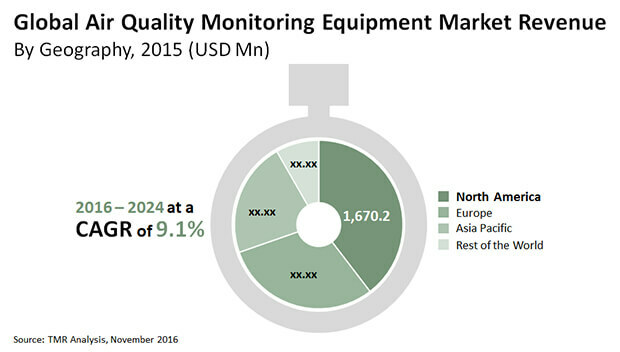 As a result, the demand in the international air quality monitoring equipment market could witness an impressive rise. Important organs of the body such as lungs and the cardiovascular system can be damaged by the penetration of air pollutants such as sulfates and black carbon. The analysts have already predicted the soaring awareness among the dwellers of countries highly prone to air pollution as a top driver of the air quality monitoring equipment market. The global air quality monitoring equipment market has been prognosticated to be checked by the expensive capital cost pertaining to the development, deployment, and planning of satellite-borne sensors. Besides this, there are costs associated with data link and database management which could limit the growth of the market. Varying light intensity and light scattering impeding the accurate measurement of air quality with the help of differential optical absorption spectroscopy (DAOS) is envisioned to cause problems in the operations. Moreover, cloud coverage limits the inspection of air quality in the lower troposphere. However, the authors of the report have prophesied some profit-making market opportunities for industry players to bank on. Technologies boasting of a greater range of application, including pervasive and remote sensors, have been perceived to be quite efficient by both producers and consumers. Such technologies incur lower costs and offer mobile air quality testing applications, which could prove vital for manufacturing ready-to-use devices. The mushrooming prevalence of airborne infections and respiratory diseases and product enhancement encouraged through stricter air quality standards are the popular trends pointed out by the report authors.